This post is a little late in the making, but in January Babe and I hopped a flight to Vegas. We had been to Vegas once before and had done the lights and glitter, so we weren't really keen to do it again. However, we had gotten a stay in a hotel right on The Strip, in exchange for listening to a time share spiel. We have gotten these phone calls many times before and have usually said "thanks, but no thanks"; this time though something made us go for it. We actually thought it was super worth it- so long as you can walk out saying "no"! You can read more about all the ins-and-outs of that experience here. Anyways, we knew we would be staying in the heart of Vegas, but we really didn't want to do all the glitz and sensory overload for 3 full days. 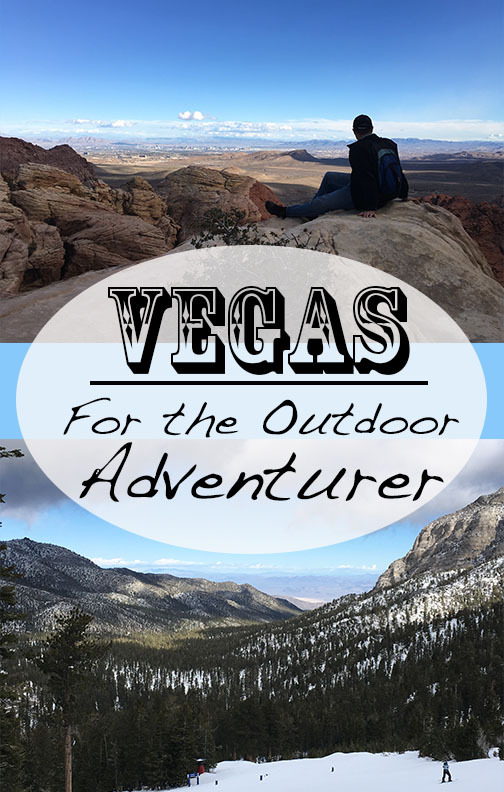 So, we researched as much as we could and planned out our trip so that we were outdoors and away from the crowds as much as we possibly could be and I couldn't have been happier about it! I LOVED our trip! I never would have thought I could like Vegas so much. To be honest, on this trip I got severely stung by the "go West bug"and I did NOT want to leave. 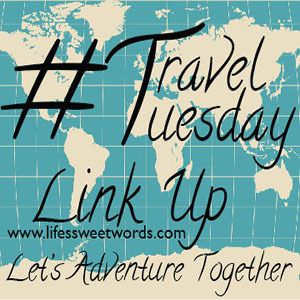 Happy #TravelTuesday fellow adventure lovers!! It's time for another link up (join at the bottom of the post)!! I have been all over the road lately, so I figured I would take today to share some of my favorite items for passing the time on a road trip! 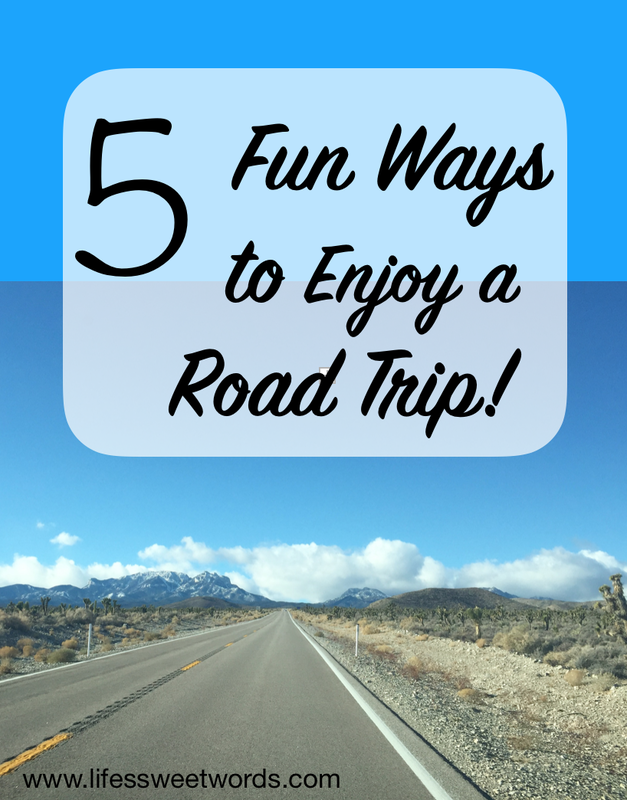 This post comes at a perfectly fitting time too, because I have been road trip crazy lately! First, we are trying to plan (and then fully execute) our big getaway, in which life will become one never-ending road trip, but secondly, we have been road tripping from Florida to North Carolina- and then between NC and Tennessee- for the last three weeks. On Sunday we will be loading up again and heading back to Orlando. I would like to think I have this road trip thing down pretty well! Maybe it was because my parents started us out with time on the road from a young age, but I LOVE a good day in the car and have found many ways to make the time more fun! 1.) A Whole Heap of Great Books! - The Night Circus by Erin Morgenstern- My number 1 recommended book, no matter what list it is! Such beautiful imagery and imagination! - Unwritten by Charles Martin- Really anything by Charles Martin, but this one- a story all about redemption and finding a way back to yourself- is my favorite of his. - The Winter People- I actually haven't read this one yet, but I LOVE Jennifer McMahon for when I am in the mood for anything spooky! Bonus: It's currently on sale for less than $6! - The Nightingale- For if you are in need of a good cry! Kristin Hannah is another favorite author of mine and, while I don't usually like historically based novels, this one was drew me in from minute one. 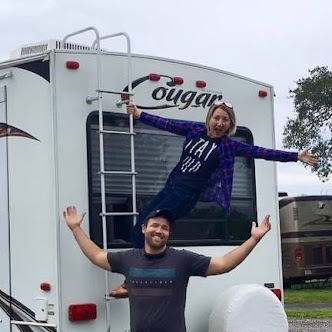 I read it on one of our very first RV road trips and Babe literally had to pull off at the nearest rest area, because I was just sobbing like a baby by the end of the book and he wasn't sure what to do with me! - The School for Good and Evil series by Soman Chainani- A fairy tale series for younger readers, these books are filled with so much fun and adventure that even older readers stay hooked! This is a series all about friendship and finding out who you truly are. Also, I thought it was just a three book series, but when looking it up to add here I found out there is now a 4th. I guess I know what I will be reading on my next road trip!! - The Secret Life of Bees by Sue Monk Kidd- Combining my love for honey and bees with a beautiful story of the things that bring people together, this is a definite must read! - Garden Spells by Sarah Addison Allen- Another favorite author, I love the touch of magical realism she throws in her books. They are easy reads, and sweet stories, perfect for finishing in just a day's drive! - The Glass Castle by Jeannette Walls- While I am not usually a memoir reader, this one was chosen for book club and had me hooked from start to finish. It's also set to be a movie, released in theaters soon, so if you are a "must read the book first" type of person it would be the perfect time to read it. - The Handmaid's Tale by Margaret Atwood- I haven't read this one yet either (or watched it), but I am super intrigued. - The Harry Potter series by JK Rowling- I would be remiss if I didn't include my favorite of all time favorites ever! While I know the entire world knows of Harry Potter and has either chosen to read it or not, if you are the latter, I just have to say "please give it a try!" I swore up and down I wasn't jumping on the bandwagon, but now, 10 years after I first did, I have read the series multiple times and am now currently listening to it on audio book!! 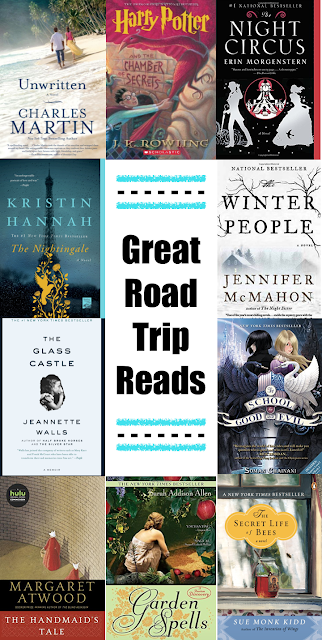 **Audio books are another great road trip go to, especially for when you are driving it solo! While Babe usually listens to music while I read we sometimes like to listen to a book on tape (dating myself haha) together. Right now, anyone who signs up for a free Audible trial for the first time, can get two free books instead of one! * The Grocery Store game- one person starts as "it" and they say "I'm going to the grocery store and I am going to buy something that starts with the letter ____". The rest of the car plays against each other to figure out what the person is buying. For example, it could be something easy like carrots, in which case that usually just gets guessed without any clues and the first person to say it gets to be "it". Usually though we try harder things (anchovies is a good one) and then people ask yes or no questions to get clues ("is it a meat?" "Do you find it in the produce section?"). If no one can guess it and everyone gives up the person who was it wins and gets to go again. * The Movie Game- Everyone goes around saying titles to movies, but they have to use the last letter of whatever movie was said prior as the first letter of their movie. For example, if the last movie said was Jaws then the next movie has to start with letter S. Movie titles can not be repeated and if someone gets stumped and can't think of a movie (or repeats one) then they are out. This continues until only one person remains and they win! To make it easier, if you have little kids, you can also include books and TV show titles. - Would you rather live on the beach or in the mountains? - If you could go anywhere in the world right now, where would you go? - If all jobs paid the same, what would you most want to do? Most of our questions somehow circle around to being about travel, but hey, can you blame us?! Each person answers the questions, even their own. If you have a hard time thinking of new things to ask we love Table Topics card sets! They even have a Table Topics: Road Trip edition! We typically load up a cooler for the car; it saves us stopping more often, as well as spending too much at the gas station when we do stop! I have been loving Amazon lately for stocking up on snack items. It beats grocery store prices and saves me a trip to the store. You can typically find my Amazon guy delivering boxes of Vita Coco coconut water and KIND Bars (less than $1 each?! Yes, please!)! 4.) Pretty Places to Stretch your Legs!! Some days we are really just having to book it but, when we can make it happen, finding a nice place to stretch your legs, even for just 5 minutes can make a huge difference! Usually before a road trip I will try to research road side attractions that are a quick in-and-out or look for any outside areas that might be nearby. Keep an eye peeled for signs too and then use your phone to see how far off the exit they might be. On this most recent trip we saw a sign for High Falls State Park and lucked out with it being not even a 5 minute drive off the highway!! 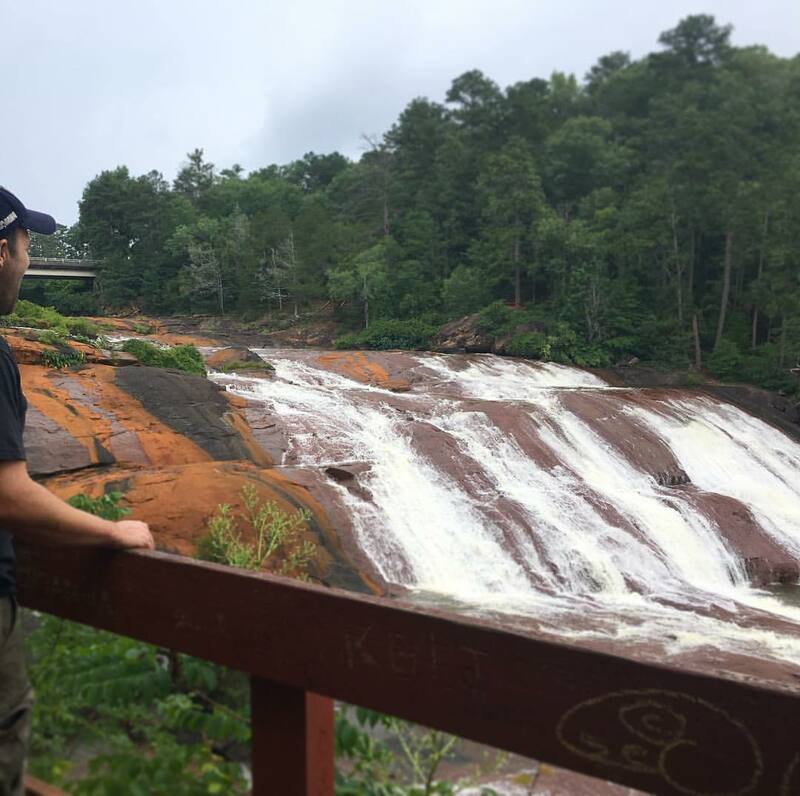 We were there just long enough to get in a bathroom break and then walk around admiring the falls for a few minutes, but it gave us a chance to get out of the car and get the blood pumping again! I am all about a good road trip sing along!! Babe may roll his eyes to most of my singing, but I think he secretly loves it!! I'm usually jamming to country, but sometimes we like to mix it up a little. What is are your go to tunes on the road?! And those are 5 of the ways we pass our road trip time! Any tips from any other road warriors out there? 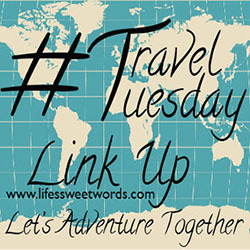 Share them or any other fun travel posts in this month's link up! ~I will also be sharing my favorite post from the month before. 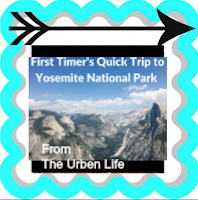 June's fave was from The Urben Life, because I am all kinds of itching to get to Yosemite NP and Jenna's pictures from her First Timer's Guide to Yosemite just spurred on my desire to get there ASAP! I can not believe that we are halfway through 2017. I took a week off between jobs (find out more in my last post), but am now back at it. Taking a vacation is great, but I always feel like there is so much to catch up on after. I am really working on trying to take it slower though and not feel so rushed to get the 'to-do list' completed. It's a glorious feeling to give yourself space to determine your own pace! So, I am not going to jump back in with a full-length travel post just yet; instead I am joining Anne for a July Currently post. ~Documenting~ All the adventures! We spent the last week traveling between Tennessee and North Carolina, visiting friends and family. I have done so much documenting that my phone is filled to the brim and I had to start deleting apps so that I could take more pictures of all the fun. Looks like it might be time for a new phone (boo), because I am in desperate need of more storage space! ~Accomplishing~ My 'to-do list'; slowly, but surely! I actually stink (real bad!) at being organized with my time. This is the first year I have actually even utilized a planner and, while it is still a huge learning process, I feel like it has made a huge difference. So I am spending the morning filling in my planner for the next two weeks and then it will be time to tackle the things I said I would do! If you are a newbie to the planner world, this one has been super helpful. ~Enjoying~ A quite morning on the porch, with my coffee and a beautiful view, to ease back into the work grind! I am still away for the next two weeks, but will be working remotely. I am loving being able to set up anywhere and enjoy a gorgeous view and fresh mountain air while I work! ~Reading~ All the things!! We road tripped up, and will be doing the same to get back home, which I love because it means I stock up on books and read to my hearts content. My current list includes the two books we are reading for book club (Small Great Things and The Orphan Keeper) and In a Dark, Dark Wood. After I finish Small Great Things my plan is to read In a Dark, Dark Wood, because it's been a quick minute since I have read a spookier book and I think it will break up some of the heart-heavy content that is in Small Great Things and The Orphan Keeper. What are you reading? Anything I need to add to my list? ~Spending~ Too much money!! I just had to buy a new computer, as I had been using my work computer for personal use as well. Leaving my old job meant leaving that computer behind. I am loving my new one, but will be trying to NOT spend very much this next month, because computers are just dang expensive!! Here's to seeing if I can keep myself from eating out in July! Have you ever tried a 'no-spend' month?! I am so curious! Any tips?! 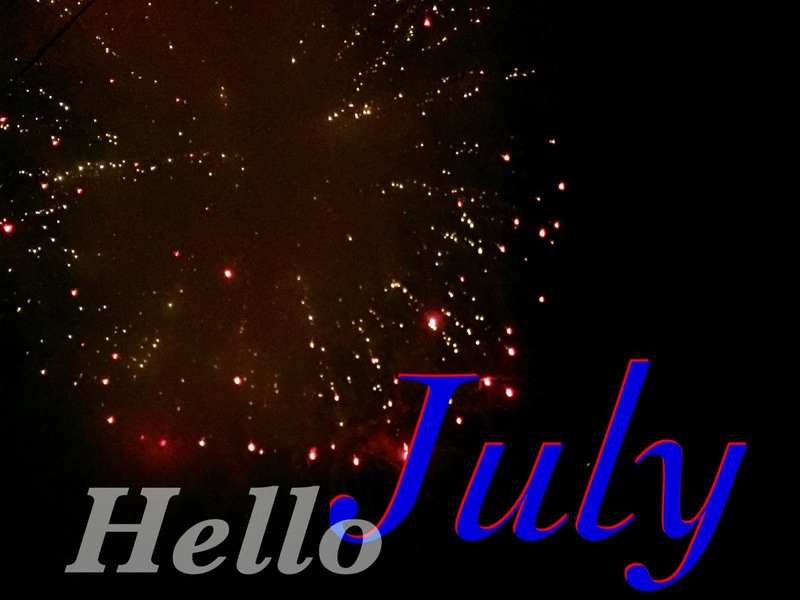 Hope your July is off to a wonderful start!! What's going on in your world currently? !